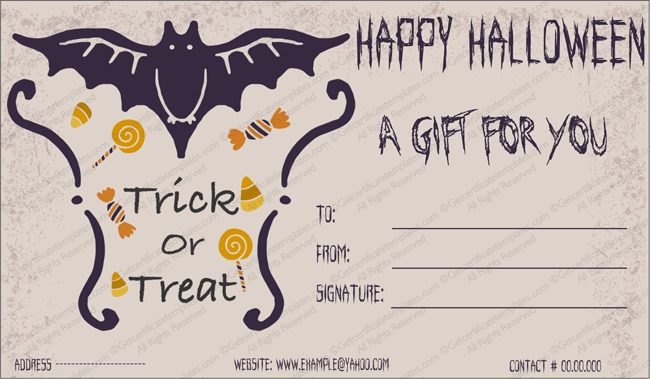 You would like to create a gift certificate that is specially made for Halloween and that has a holiday look to it. You would like to create something that is colorful and fun, yet dark and a little bit scary. You will find that this blank Halloween gift certificate is just what you are looking to create. This certificate allows you to show your love for Halloween and it helps you create a gift that is perfect for the holiday. This template includes space for the name of the one who is giving the certificate and it also includes space for the name of the individual who is receiving the certificate. This template includes an image that is fun and Halloween focused. You will love this blank Halloween gift certificate template and all that it offers to you, and you will enjoy using it to create a special certificate for Halloween.